"Using dates in place of sugar makes for a very fudgey and chocolaty-tasting brownie with no added sugar. 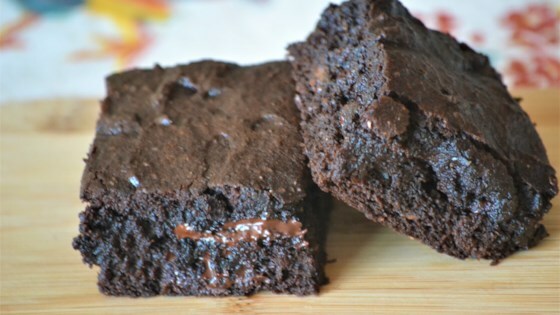 These brownies are slightly cakey; if you prefer a denser brownie, use only 1 egg instead of 2." Place dates in a small bowl and pour in hot water. Soak for 10 to 15 minutes. Preheat the oven to 350 degrees F (175 degrees C). Line an 8x8-inch baking dish with parchment paper, leaving enough paper to hang over the sides of the dish. Drain dates and transfer to a food processor. Pulse until dates are completely smooth, 1 to 2 minutes. If date paste is too thick, add hot water 1 tablespoon at a time until completely pureed. Add softened butter to the food processor and pulse to combine, about 30 seconds. Add eggs and vanilla extract and process until light and fluffy, about 1 minute. Add whole wheat flour, cocoa powder, baking soda, and salt. Pulse until mixture is just combined, about 30 seconds. Gently stir in chocolate chips by hand. Pour batter into the prepared baking dish. Bake in the preheated oven until edges just begin to set, 20 to 25 minutes. Cool in the pan for 10 minutes, then remove brownies from pan by gently lifting up edges of parchment paper. Allow to cool completely on a cooling rack. Cut into 16 pieces. Better the next day. Followed exactly and turned out really well. May need to add a bit less cocoa for those who prefer a sweeter chocolate taste.